Desmos is an online web application that gives you the power of math graphing calculator like never before. This simple to use and intuitive math tool is a perfect example of next-generation web experience that can greatly help your school and work project like in mere seconds. Amazing free online graphing calculator! Powerfull editor that is hosted by Desmos enables you to create math graphs of all varieties – from simple school projects to complicated scientific graphs directly in the window of your favorite web browser. No download is required, no special hardware is needed. All calculations are done on the powerful servers of Desmos, and results can be hosted in the cloud server of your choice (Google or Desmos). 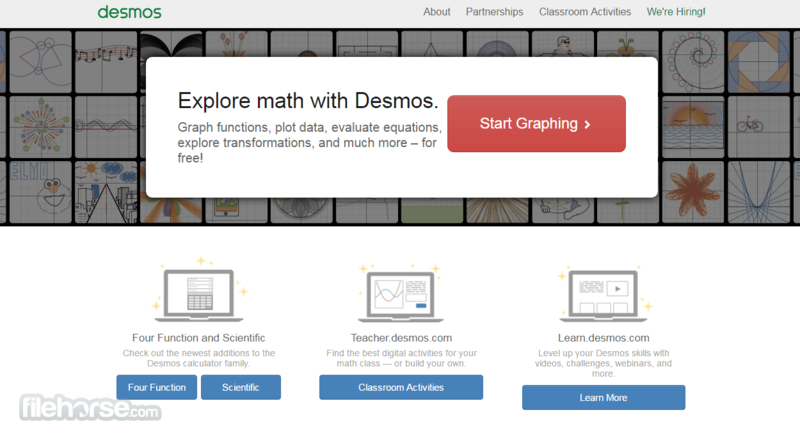 Desmos is today used by countless student, teaches, math enthusiasts, and researches. Join them! Explore the world of Math with Desmos Calculator! Math tools can easily be found today on the internet, but only few bear distinction of having that hard to find mix of simple interface, powerful tools and ability to serve both novices and professionals, all the while enabling users to access on no matter what device they are using. However, even though those apps are rare, when you find one you can immediately feel that it will become your close companion in your work, learning and research. Desmos is one of those apps. Founded in 2010 with a goal of becoming one of the best free graph calculators on the web, this great tool expanded its service that today’s serves millions of users with best browser-based interactive whiteboard tool for learning. With users coming from over 169 countries around the world and significant funding that is arriving in regular intervals, Desmos represents a learning app with very bright future. Desmos is one of the most popular graph calculators that you can find on the internet. No matter if you are just interested in the world of math, or you are required to have contact with it on daily basis (students, teachers, researchers, artists! ), Desmos will help you to easily plot all kinds of different equations, functions, inequalities and create fantastic looking graphs. Desmos can be used in education, research and even in business for calculating statistics and probabilities. With unlimited math potential and very intuitive and easy to use interface, Desmos represents one of the best tools for knowledge gain, practice, and solving of advanced math problems. However, even though Desmos is capable to do all that, it is also extremely usable for smaller tasks such as homework, individual research, practice, small group collaboration, teacher-led lessons, student-driven work, class learning and much more. Since the appearance of Desmos on the web several years ago, its developers have introduced several new tools and services that have expanded usability of Desmos significantly. If they continue to expand Desmos with regular updates, very soon this app will reach the functionality of truly professional tools like Texas Instruments graphing calculator. However, even in its current state, Desmosrepresents invaluable learning tool that can be used by anyone, anytime. Its entire interface and tools are powered by HTML5, making it accessible from PC, smartphones and tablets. Just fire-up your browser, and math calculation and graphing will become easy. Amazing free online graphing calculator! 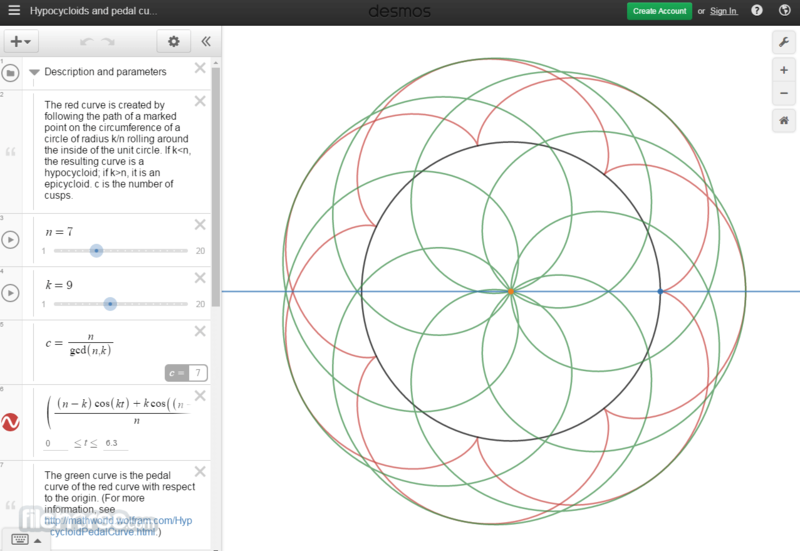 Interface of Desmos is extremely simple. On its main site you can see large “Launch Calculator” button that will lead you to the full screen calculator page (creating user profile is not needed). There you have very user friendly (and touch friendly) interface for entering formulas, equations, and plotting of graphs. All of its tools are easily accessible no matter from where you are accessing Desmos (PC browser, tablet, smartphone). Demos can be used without limits for free even without new account. However if you want to create your own profile where you will be able to save graphs and equations for later use, you can do so very quickly either via your own email address or by linking Demos with your old Google account. Desmos is a fantastic learning tool that can enable anyone access to state of the art math and graphing tools. If you are student, teacher or researcher, Demos need to be bookmarked in your browser.